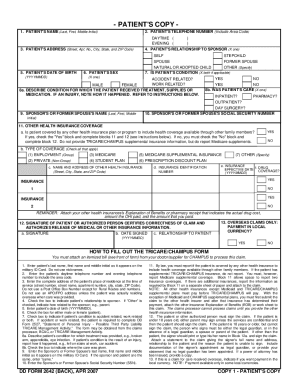 TRICARE is not the form you're looking for?Search for another form here. Sep 22, 2015 ... 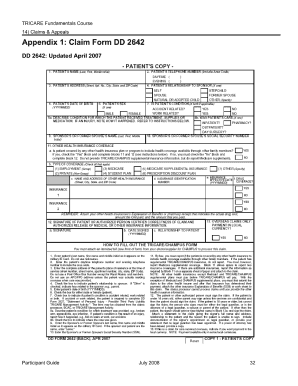 The page providers information to health care providers about enrolling ... Health Services · Patient-Centered Community Care (PC3) Program ... "EFT/ACH" sections of Form VA 10091, FMS Vendor File Request form. ... The VA will pay your non-VA medical care claims using their SmartPay Purchase Card. DD FORM 2642 APR 2007 PREVIOUS EDITION IS OBSOLETE. COPY 1 - PATIENT S COPY Adobe Professional 7. 0 2. If the sponsor and patient are the same enter same.